The earthship concept was created in the 1970s by architect Mike Reynolds in New Mexico. “Gunsmoke” actor Dennis Weaver, a noted environmentalist, built one in the ’80s. 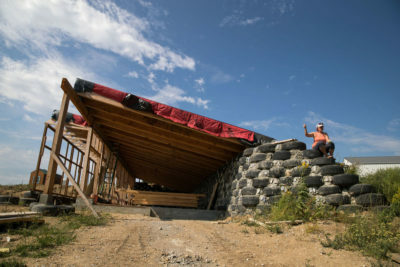 This entry was posted in Green Building, Nebraska / Midwest News, NewsBlog and tagged earthship, green building, Nebraska's first earthship, Nebraskans for Solar, off-grid living, sustainable living on October 11, 2017 by Helen Deffenbacher.